South by Southwest was fun, and intense, and rowdy, and everything at once. It was so good to be back on the stage together. We were really nervous for the first time in many, many years, which was also a good feeling. You also played there back in 2010, correct? Yes, we did, so it was nine years later. Have you played in any other American cities besides Austin? We did have our own show in New York, I think it was the same week as when we went to South by [Southwest] last time. So people had actually traveled from so many different states to come see us, because…we hadn’t even released music [in the United States], so it was the really diehard fans who needed to see that show. Some of them had been on an airplane for five hours. We were very honored, yeah. I have a two-part question for you. What was the most important thing you learned about yourself in the time between this album and the previous one, and what is the most important thing you all learned as a band between this album and the previous one? Wow. Speaking for myself, I’ve learned that I can contribute in the songwriting, after practicing a lot with my solo project, and really narrowed down what I think is a good pop lyric, so I really feel much more empowered in the studio now, to write the songs with Anders [SG, Alphabeat co-lead singer] and Anders [Bonlokke, guitarist/keyboardist], and I pitch in much more. And I guess that leads me to what we’ve all learned, which is that right now we’re very focused on being a team, and everyone contributing, and putting something in this pot that ends up being the Alphabeat menu. [Chuckles] It’s so important for that energy, that makes us Alphabeat, that you can feel that we loved recording the songs, and really have fun doing what we do. We really try to put that energy down into the recordings right now. You actually hinted at what I was about to ask you next, which is that the band has finally signed their first American record deal, but it’s not your first American record deal (Bramsen released an EP on Universal last year). How was your experience going through the American music machine as a solo artist? It’s such a huge market, when you’ve grown up in Denmark. You don’t even expect anything to happen when you sign something in the US, because it’s just feels so massive. You do feel like you can disappear in a sea of so many talents. And it’s rough, but the UK market was rough as well. You know, if you don’t get your Top 10 single, you’re kind of out. So we got tough skin, I guess, being in the UK, and I think that’s good, now that we’re entering the US as well. Let’s talk about “Shadows,” the new single. This has a more guitar-driven sound than your previous work. Is that a sign of things to come with the upcoming album? Yeah, you might have a point there, because for us, it’s kind of like back to our roots, making the songs old school, on a guitar or a piano, saying, ‘I’ve got this really rough idea here. Can we try and finish it together?,’ instead of on our last album, where Anders and Anders were so protective of some of their ideas that we didn’t even get to hear them before they were almost done. They were more electronic, and everything made on a computer kind of thing. So this album is quite old school, and back to our band roots, and you will probably hear quite a lot of guitar on all of it. Do they have a [release] date scheduled? The only thing I’m seeing is the fall. Well, do they have a month scheduled for the album? No, there isn’t a date yet, I’m afraid. I think we’re aiming for October. The band had major label support overseas, and that’s the part I don’t understand. I’m surprised that they weren’t able to secure you an American deal sooner. There were lots of strange timing things, and we hardly knew all those pieces. It’s something that we’ve talked with our manager about now, ‘What actually happened?’ We almost had a US deal at one point, but for some reason it fell through, because of one person who wasn’t sure, and then everyone suddenly wasn’t sure. And there were two managers, a Danish manager and a UK manager, and they couldn’t quite agree. Sometimes stuff like that ends up …little details like that end of being the reason that something doesn’t happen. That must have been frustrating. Yeah, it was frustrating, but at the same time, we stood at a point where we were like…we got asked if we wanted to go on tour with Katy Perry, to support her. And that was a great opportunity to try to enter the US scene, but that would also mean that we had to spend two more years promoting the album that we had already spent three years promoting in different countries. And we just really needed to get back in the studio and write some new stuff, some new material to talk about. We’d been talking about ‘Fascination’ for ages, telling the same stories over and over again, and answering the same questions. We felt that it was very important for our own motivation to get back in that studio. Sometimes timing is just, you know, tricky. Here’s the most jaw-dropping thing I took away from your discography: “Chess” was never released as a single. What? [Laughs] Ah, you like that one. I have a podcast, and I played that song on my very first show. Awwww. I’m glad to hear that. That was one of the few songs that I was actually a co-writer on, so I have a special place in my heart for “Chess” as well. I’m at the point in my questions where I was going to ask you about bits that I saw on your Wiki page, about these massive tours that you never did. You mentioned one of them, which was Katy Perry offering to bring you to the US, but there was another one involving the Spice Girls, which you turned down because you were worried that no one was familiar with the band yet. Yeah, that was also a matter of timing. We were only just about to begin in Europe, especially the UK, and we just worried that people would misunderstand what we were about. If we started out supporting the Spice Girls, even though I was a huge fan of them as a teenager, they were a manufactured band, and it was so important for us that people understood that we were high school friends who decided to make a band, and we worked our asses off from the very beginning, and took one little step at a time. So yeah, it was tough for me to say no, I adored the Spice Girls. But I also knew that it was a good decision. That is an excellent point. You wouldn’t want to give anyone even the faintest impression that you were somehow not real. Exactly. Because that’s what makes Alphabeat unique. It’s pop music, but it’s still, like, a real band. You will eventually tour the US, I’m hoping? Yeah, hopefully. That’d be amazing. 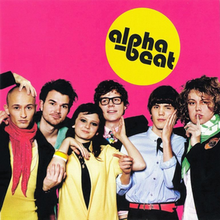 I am very familiar with This Is Alphabeat, the international release of your first album, but last night I ordered the Danish version of Alphabeat, the one with the red cover where you all look like you’re about 12 years old, even the one with facial hair. What can I expect from the original recordings of those songs? Oh, wow. Well, it’s probably going to sound even more real. We didn’t really know what we were doing, and that’s the charm of that album. We just recorded what we loved, and we didn’t have marketing skills, or any idea of how to promote music. We basically just made music, and loved doing it. And I guess you can hear that. “Boyfriend” sounds different, the first version. It kind of got pumped up in the UK, with [a new version produced by] Mike Spencer. I think there will also be songs that you’ve never heard before. If you want more details about that, I’m just outside the studio, and Anders will definitely remember better than me. That’s all right. I did notice that there were quite a few tracks that didn’t make the other record. So wait are you recording right now? Yeah, we’re trying to finish the album, so we meet up most days a week for some hours. And we’re doing a documentary as well. Yeah, there’s a Danish TV station filming us, like, most of the time at the moment, so every time we do something they find interesting, they are here. Anders [Note: we are not sure which Anders we are speaking to, but our money is on Mr. Bonlokke]: Hello! Stine was just next door, and you asked her about the Public Image Ltd. cover. I think it was because I saw a movie when I was younger, like, 100 times, maybe, that the song was in, and I didn’t really know the band, but I just really liked the song, and for the UK album, we just wanted something that was kind of the opposite of obvious. So we did this cover, and it was weird to do, in a way, but [asking someone nearby] did we play it live, ever? Okay. But on the other hand, the band used to do, more, like, guitar, maybe not like Public Image, but more in that direction, so in that way, it makes sense. It was just a song that for some reason I loved, so we did that. Thank you for explaining that. I appreciate that. Best of luck with the record. Maybe if you hit Chicago, that’s pretty close, so we will try to make it up for that. Okay, I’ll try to push that in. I’ve always wanted to see Chicago, so that makes sense. Tagged Alphabeat, Danish pop group Alphabeat, Interview with Stine Bramsen, Stine Bramsen.